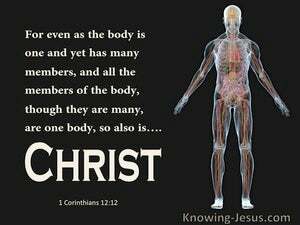 ﻿ 1 Corinthians 12:12 For even as the body is one and yet has many members, and all the members of the body, though they are many, are one body, so also is Christ. For as the body is one and has many parts, and all the parts of that body, though many, are one body-so also is Christ. For just as the body is one and yet has many parts, and all the parts of the body, though many, form a single body, so it is with the Messiah. For just as the body is one and has many parts, and all the parts of the body, being many, are one body, so also is the Christ. For as the body is one, and has many members, and all the members of the body, being many, are one body, so also is the Christ. For as the body is one, and has a number of parts, and all the parts make one body, so is Christ. For just as the body is one and has many members, and all the members of the body, though they are many, are one body, so it is with Christ. For as the body is one, tho' it has many members, and all the members of that one body, tho' many, are one body: so also is the body of Christ. For even as the body is one and has many members, but all the members of the body, being many, are one body, so also is the Christ. For just as the body is one and yet has many parts, and all the parts of the body, many as they are, form one body, so it is with Christ. For as the body is one, and yet hath many members, but all the members of the body, many as they are, are one body, so is Christ. For as the body is one and has many members, and all the members of that one body, being many, are one body, so also the Christ. For as the body is one, and has many members, and all the members of that one body, being many, are one body: so also is Christ. 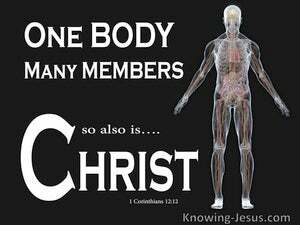 For just as the body is one and has many members, but all the members of the body, [although they] are many, are one body, thus also Christ. For as the body is one and has many members, and all the members of that one body, being many, are one body; so also is Christ. For as the body is one, and hath many members, and all the members of one body though they be many, yet are but one body: even so is Christ. As the human body is one and has many members, all the members of the body forming one body for all their number, so is it with Christ. For just as the body is one and has many members, and all the members of the body, although they be many, are one body; so also is Christ. For just as the body is one and yet has many members, and all the members of the body -- though many -- are one body, so too is Christ. For as the body is one, and has many members, and all the members of the body, being many, are one body; so also is Christ. For as the body is one, and hath many members, and all the members of the body, being many, are one body, so it is with Christ. For as the body is one, and hath many members, but all the members of that one body, though many, are one body: so also is Christ. For just as the human body is one and yet has many parts, and all the parts of the body, many as they are, constitute but one body, so it is with Christ. 11 But one and the same Spirit works all these things, distributing to each one individually just as He wills. 12 For even as the body is one and yet has many members, and all the members of the body, though they are many, are one body, so also is Christ. 13 For by one Spirit we were all baptized into one body, whether Jews or Greeks, whether slaves or free, and we were all made to drink of one Spirit.